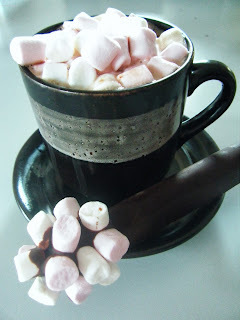 For a luxuriously thick hot chocolate stir one chocolate stick into hot milk until it melts away. 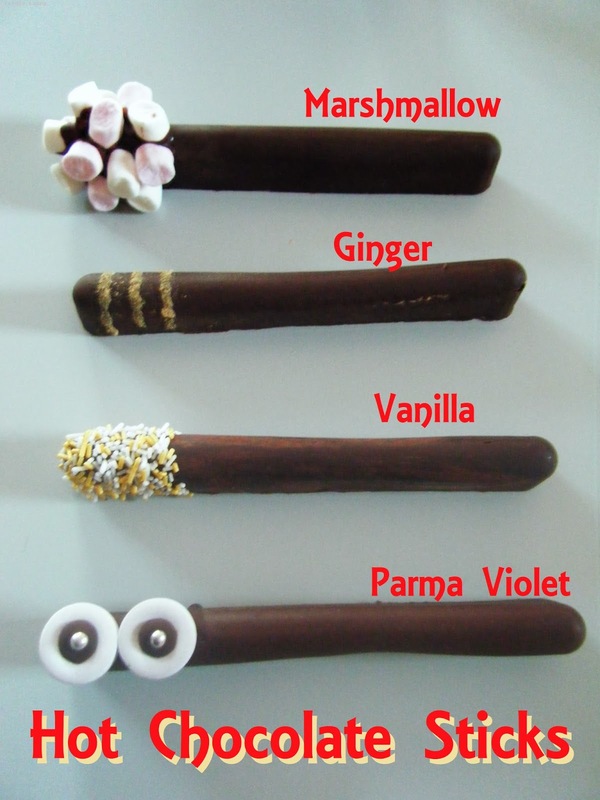 Another great gift for your Christmas gift hampers are these hot chocolate sticks. They are heavy on the flavour so you wouldn't want to eat one on it's own but if you stir it into hot milk you'll have a home made chocolate full of your favourite flavours. I used a chocolate with 80% cocoa for these sticks, that much cocoa can be a little bitter so I balanced it out by sticking on these cute and sugary little marshmallows. These sticks are very simple to make. 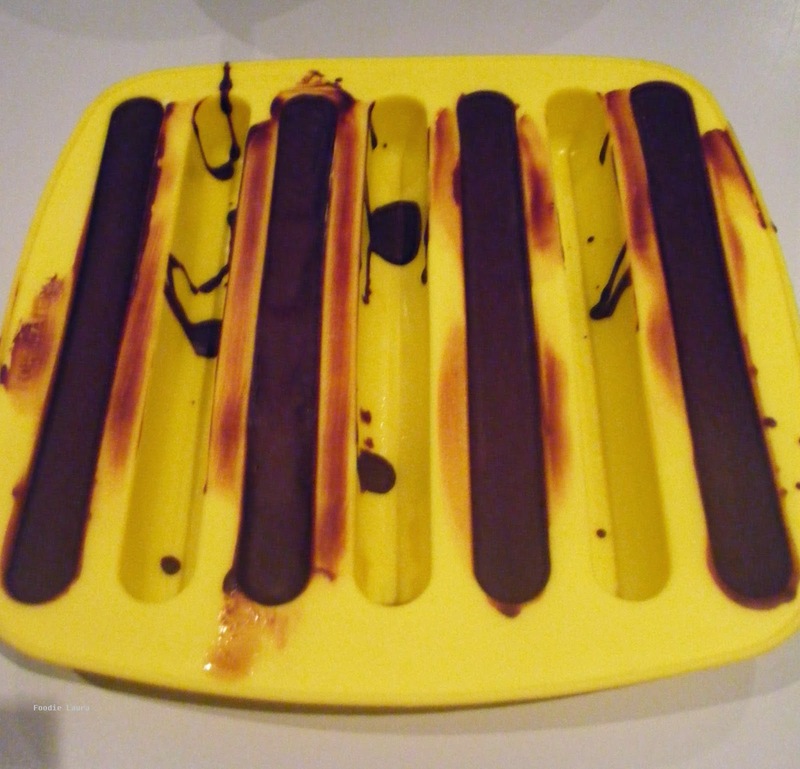 Mix good quality chocolate with your favourite flavouring and set them in an ice cube tray. I used this long thin ice cube tray because the sticks that it makes melts more easily hot milk. You could use square ice cubes, they would just need a bit more stirring up to get them to melt. I adore Parma Violets and dark chocolate, these perfumed sweets coupled with a stick of dark chocolate ate my ultimate hot chocolate combination. What would your ultimate hot chocolate combination be? Each stick is 50g of chocolate and takes 1 teaspoon of flavouring. It seems like a lot of flavour to add to each stick but remember it will be diluted when you melt the sticks into milk. Trevor is keen to try a chilli flavoured chocolate next. Wrap you sticks with some ribbon and cellophane and give them as Christmas gifts or add them to your Christmas hampers.